migya wrote: I came to the conclusion, (mostly through the works of David Icke, an author of some five books, and conspiracy documentary maker), that humans were created by aliens that exist on a planet called Nibiru or Planet X that orbits our sun as well as its own star, the Planet X that has been spoken about as now approaching the earth from the south and soon to pass close by in 2012, thus being the major reason responsible for the global cataclysms that are said to happen in 2012. Alex Jones' conspiracy documentaries have also been source of New World Order information the last year or so. Migya, I am trying to be understanding here but I think you have completely lost your mind. It is apparent that you WANT to believe something MORE than what "typical" human beings are aware of but you seem to be so easily guided by writings and videos you come across. Your complete understanding of the universe seems to change so readily, much like a cult follower. I mean seriously Migya, we were created by Aliens from planet Nibiru??? So you are so ready to accept THAT as the truth, but ignore the THOUSANDS AND THOUSANDS of pieces of science showing the EVOLUTION of life on this planet? Well Bada, if you read through the whole lot that I had written, you would know that that is what I thought and now have changed views. You talk about pieces of evidence that science has, well I didn't think that humans were created by aliens from another planet just because I thought that would a good thing to believe, I got that from evidence or research from other people, like people who have studied ancient civilisations, such as Sumeria, where that original theory came from apparently. As for evolution, that's something different. I haven't spent alot of time studying evolution, but some of the evidence is definately plausible, like the skulls found that look like intermediates between apes and human. bada wrote: Secondly, I will never discuss religion on this forum as it is just too charged of a topic and I would not want to offend anyone but if I get this right, you just called Catholics satan worshipers??? bigstrads wrote: Do we really have to sit here and have this F'ing lunatic we used to call "Mig" speak like this? I mean Migya, really..............I dont give 2 sh*ts what you want to talk about, what conspiracy you want to talk about, WHATEVER. But to talk to us as if none of us have EVER read a book/article/paper before!!! REALLY F*CKING PISSES ME OFF!!! Honestly, its like a child.............a child who has been so easily led into something, by the merest of facts or influences. I hope you understand that.............that Im not disagreeing with your "points" or "views"..............what I mean by that is that I think you are now completely off your f*cking rocker. I mean SERIOUSLY!!! You honestly think you are able to say, in the most matter of fact way = "Yeah, catholics are satanists........I read that the other day"
I dont know what has happend in your life recently or before, or whatever has lead you to this DRASTIC change in your personality and how you talk to people. But if there is anything, then please just talk to us, ask us for help............ANYTHING other than this strange and ugly incarnation of your former self. Here you go again with your authoritarian spat! Take a laxative Bigs! What I've said, and it was not to put down anybody or to be put down by anybody else, was that I've come to this conclusion. If you are of a different opinion, good on ya, but don't rag on anybody else, because they think differently, which is what you have done here somewhat. When I write about conspiracies, whatever, it's to create conversation, open people's minds to more than what you encounter on the TV etc. Basketball is good, I love it, but that's not all we intelligent beings can think and talk about. And I've explained above about the catholic church statement, so don't exaggerate or pervert what I've said! The thing with the Catholic Church is they seem to have a bad rep as of late!!! But out of all the Jesus Religions, they are the ones who are portrayed as evil in movies. I can't help but laugh at the DaVinci code type thriller where you find out the Archbishop is practicing Witchcraft n needs the missing document to Raise hell from Lucifer.. BLAH BLAH BLAH! Ah Migs... That Catholic=Satanism comment was a bit out of left field, I read it like how BIGS is retorting, but im not the resident crusader around here who stands up for whats right or wrong, so i leave that duty for others. 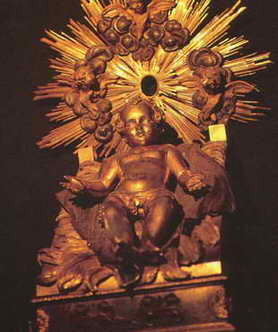 Golden child in the Vatican treasury, like so many other images of the child in Catholic Churches, represents the rebirth of the sun. 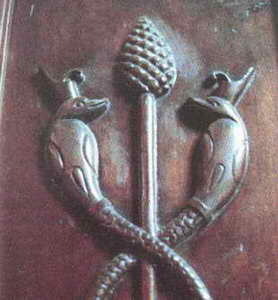 This pine cone staff in the Egyptian Museum Turino, Italy is a symbol of the solar god Osiris and originated in Egypt where he was their messiah who died for his people and whose Mother, Isis, was worshipped as the Virgin Mother. 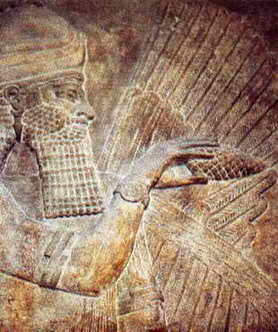 Assyrian winged god with pine cone, representing power of regeneration, traceable to Tammuz of Babylon. 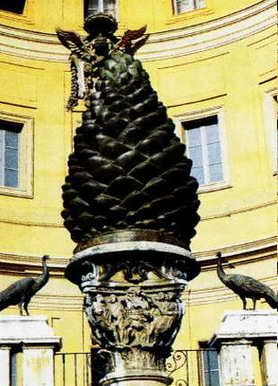 The Roman Catholic Church utilizes the pine cone just as any good Pagan religion would do. 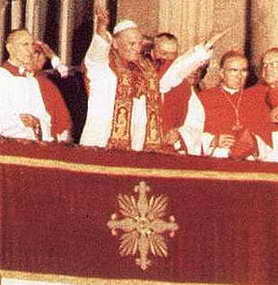 This is further evidence that Roman Catholicism is more Pagan than Christian. 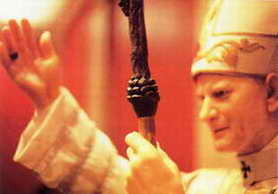 The Pope carries a pine cone mounted on his staff. A tablet from the early 9th century B.C. 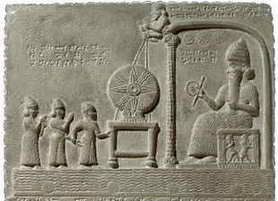 which depicts the Babylonian sun god Shamash seated on the right, holding emblems of his authority, a staff and ring, and the king with two attendants on the left. In the center on an altar is a large four point sun image with additional small wavy rays between the points. 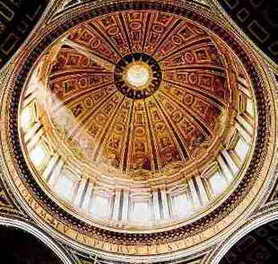 Looking up into the dome of St. Peter’s you will notice the very obvious 16 ray sun wheel. 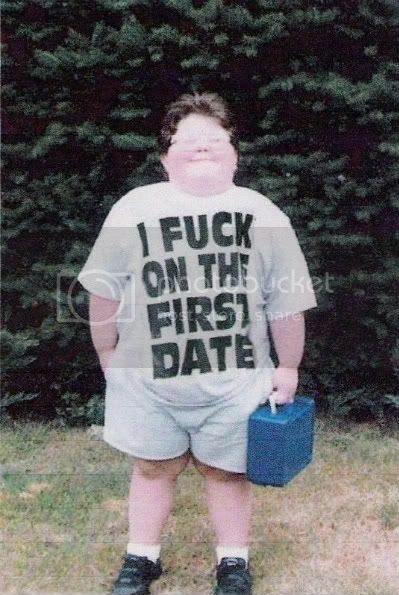 exaggerate or pervert what I've said! Mig, why is so difficult to read and acknowledge what others and I have been saying to you for months? As you constantly reference to, you read alot, you take in alot, you interpret alot. So............for the 37th time.............do you understand that other and I are not pissed/disagreeing with you because of your opinions or subjects................its the WAY you communicate them!!! 1 - My objection to your comment about "Oh yeah, catholics are satanists........I read that the other day"
Wasnt that you are saying cathloics COULD be satanists.............its that you, so matter of factly (and based on "some article" you read "the other day").............its that you were saying THEY ARE. 2 - My supposed "authoritarian" reaction to your recent posts.............have ALL been in the veign. Never once have I disagreed or argued with you with you about the content............my reactions have come from how you talk to us, in the sense of you being the all powerful and knowledgeable being that you now are of course.............your the only one who can read and research..............your the only one who can be bothered to find things out............your the only one who cares................you the only one who KNOWS! Its pathetic, and its insulting to the intelligent, well informed people of this board..............it is pisses me off. If you cant understand that, and keep ignoring my bringing that to your attention (ie: all you do is talk about how Im pissed at you because you have a different opinion to me...........the funny thing being, that alot of the time I havnt, its just that you talk like your the only one who could possibly know these things)..............then I have nothing left to say to you in any respect, because if thats what your going to do and how you are now, then I cant reason or discuss anything with you. And you are then/now in the class of the J-Rich's/David/Uptempo (when he constantly differs/blames everything on Mullin)............in that you cannot reason or actually discuss anything with those people, without them constantly ignoring what you say and bringing to another issue that wasnt even being discussed..............just to ignore the reality of what is really happening. every conquering nation and religion has taken on the attributes of the conquered areas old gods and religion and assimilated those into their own religion as to get more of the population to go along with the change more quickly and smoothly. Money Morrow wrote: every conquering nation and religion has taken on the attributes of the conquered areas old gods and religion and assimilated those into their own religion as to get more of the population to go along with the change more quickly and smoothly.